Public education activists are living through an interesting moment now in Philadelphia. The School Reform Commission is being disbanded. In the coming months Mayor Jim Kenney will be appointing a school board from nominations put forth by a select panel. The process is murky, and a pattern of closed-door education policy decision-making has been established here, here, and here. Last night, the Philadelphia Chamber of Commerce held a ticketed event to discuss the future of business in our schools at Girard College, an important site of struggle in the Civil Rights Movement. You had to be a Chamber of Commerce affiliate to purchase a $35 ticket for the event, which included the following language on the event website. It appears the future of public education in our city is being mapped out by industry, venture capital, and well-connected non-profit and higher education partners. The people, meanwhile, are left standing outside the gate. Last night, however, the real action WAS outside the gate as a dozen activists carried out an act of civil disobedience to contest policies of exclusion and shine a light on the mayor’s hypocrisy in casting this new school board as a step towards accountable local control. Because what does “local control” actually mean if educational policies are being directed by the hands of elite interests in Greek Temples with no teachers, students, or parents present? 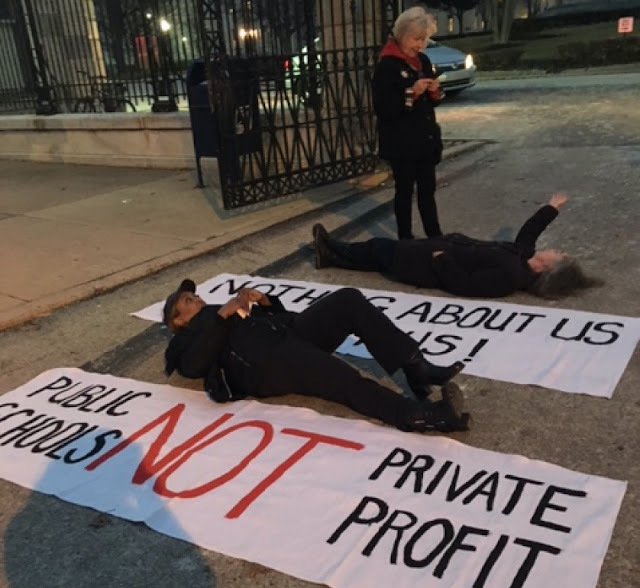 On January 29, 2018 from 5-5:45pm we claimed the space in front of the entrance to the Girard College campus, carrying banners that read “Nothing About Us Without Us,” “Public Schools NOT Private Profit,” “Teachers Before Tech,” and “Our Children Are NOT Data, Human Capital, or Impact Investment Opportunities.” This blockade compelled attendees to park along a nearby street and walk past the people to the gates where members of the Caucus of Working Educators pressed our demands for transparency in school governance into their hands. Click here for a copy of the handout we gave attendees. The video below provides a 15-minute overview of the action. and to view two videos about the demonstration.